Before I move on, let me tell you a bit about my fascination with the 'Black Widow'. I've always been a fan the 1955-57 Chevys. 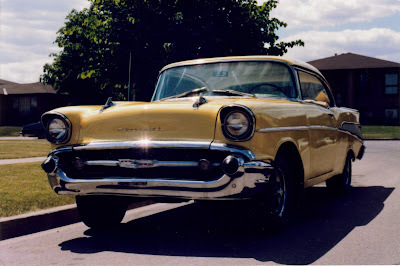 My dad owned a series of them when I was a kid, he was particularly fond of the 1956 Chevy, and I guess that is what got me hooked on them. But I liked the '57 Chevy more, probably because of the rear fins and the 'rockets' on the hood. When I was a teenager and had a part-time job, all my money went into cars and girls (not necessarily in that order), and I owned a series of pretty cool cars, 1973 Monte Carlo, 1969 Chevelle, and a 1957 Chevy 2-door hardtop. My '57 originally started life as a 210 model with a 235 'Blue Flame' block. When I got it, it had been chromed up in Bel-Air trim, had been filled with bondo, and been butchered in other areas. I eventually got a Chevy 350 4-bolt main in it with heads off a 327 on it, along with headers, low flow exhaust, 650 cfm Holley carb, a muncie 4-speed, and a 10-bolt posi out back. I also rewired the whole thing, fixed the body (better than it was anyway) and painted it 'Tweety' yellow. Man, that car was Outsider 'tuff' - see the picture. Anyway, at that time I also bought and read every single Hot Rod-style magazine there was out there. 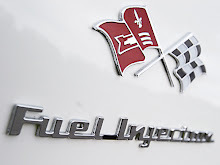 In an edition of Chevrolet High Performance I came across this article about a certain black and white '57 Chevy 150 sedan. I wasn't really into sedans, let alone 150's, so I skipped the article at first. It wasn't until I was completely done all of my magazines for that month and was waiting for the new issues to arrive on newsstands that I went back and read the 150 article. Man I was blown away! It was about the 'Black Widow' stock car. I never heard of them until that very moment. I read that article probably a thousand times. I was hooked. I wanted a 'Black Widow' even though I knew it would be next to impossible to get an original one. So here I am 20 yrs later still wanting an original 'Black Widow'. I've thought about building a clone several times over the years, but I haven't. I would know it was not an original one. I think if I were going to build a clone car I would do a 1966 Shelby Cobra instead. You see, the 'Black Widow' isn't just a stock car, part of its allure is the story behind it. If you own a 'Black Widow' you not only own an antique stock car, but also own a piece of automotive history and it all started with the '1957 Chevrolet Stock Car Competition Guide'. Next Post: "The 'Competition Guide' Story"